you are aware that CBD produts are only available for shipment in the United States. A naturally derived alternative for pain management, stress and anxiety, hair and skin health, mental health, mood enhancer, brain fuel and many other ailments. Our hemp extract is naturally vapor distilled without a sharp or bitter taste like other hemp oils. The naturally nutty and sweet flavor mixes well when added to food or drink. Available in 300mg, 750mg, and 1500mg. Sawatch exclusively uses the NES Vapor Distillation™ process to extract all cannabinoids and beneficial terpenes from our organically grown hemp. The process uses heated air to gently extract both the cannabinoids and beneficial terpenes without the use of chemicals or harsh solvents. Heated air is passed through our hemp flowers to evaporate the cannabinoids and terpenes from the surface of the hemp in the form of a vapor. This vapor is then collected and condensed into a terpene-rich, full-spectrum high CBD extract. Sawatch extracts are flash activated in less than two seconds, so the plant’s natural terpene profile is preserved. By using flash activation, our extracts contain the highest level of naturally-occurring terpenes of any activated edible extract. 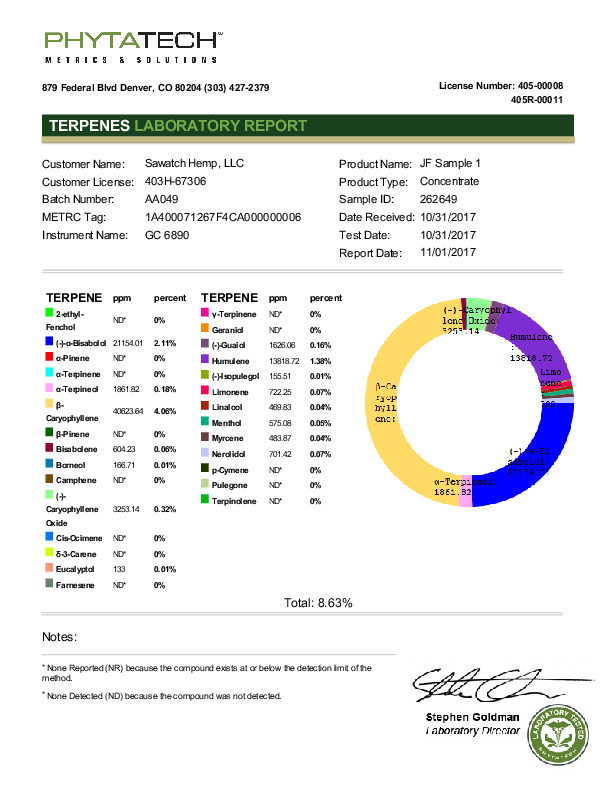 Since terpenes are required to experience the full effects of CBD and other cannabinoids, our customers report that our terpene-rich extracts are more potent than those produced with other extraction methods. 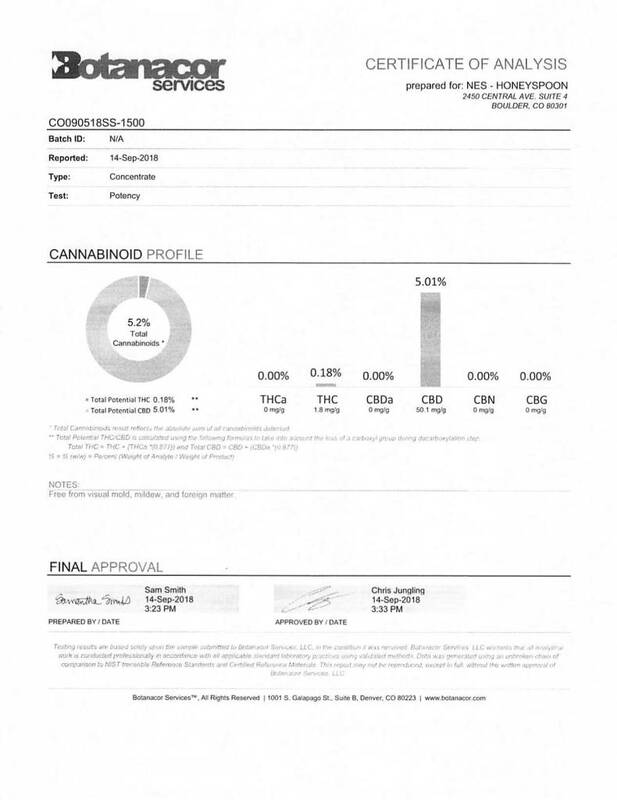 When a hemp plant produces CBD, it is produced in the form of CBDA. For CBD to be available to the body, the naturally occurring CBDA must be converted to CBD. This process is known in the hemp industry as activation or decarboxylation and is accomplished by heating the CBDA until it chemically converts to CBD. Conventional methods of activating CBD include exposing it to high heat for 45 minutes to several hours until most of the CBDA is converted to CBD. This conventional activation process drives off and destroys most of the plants volatile terpenes, in turn lowering the efficacy of the oil. CO2 extracted hemp oils contain high levels of carbonic acid, which can impart a sour flavor to food products. Ethanol extracted hemp oils contain plant chlorophylls and water-soluble fractions that can impart a bitter flavor to food products. Butane, Hexane, and Pentane extracted oils are not considered organic and can contain chemical adulterants. 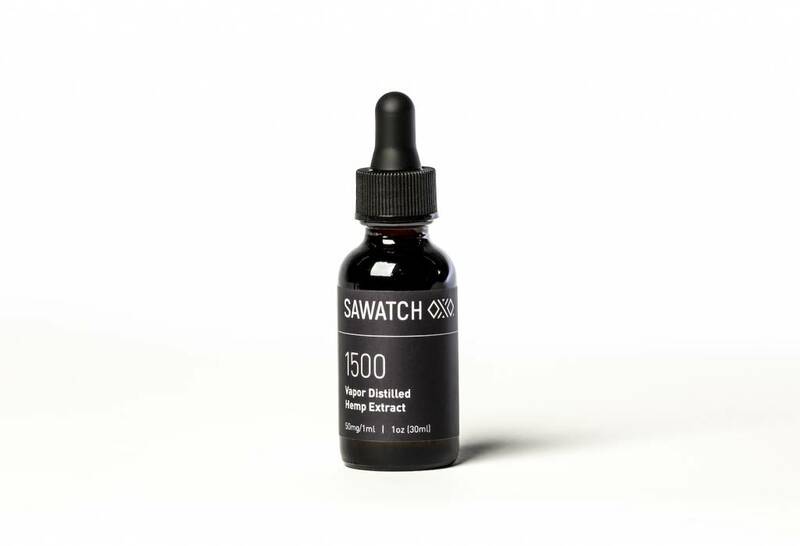 Sawatch extract is the top naturally-extracted hemp extract on the market and is completely free of chlorophylls and carbonic acid and therefore does not impart undesired flavors to food. By exclusively using Vapor Distillation to extract our cannabinoids and terpenes, our extract has a neutral, nutty, sweet flavor that is barely noticeable and mixes well into all food products and nutritional supplements.